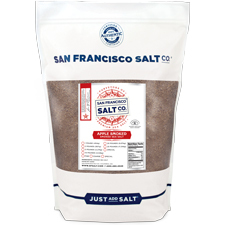 Add a sweet and savory touch to your dishes with this delectable smoked sea salt! Smoked Applewood Sea Salt is made with pure sea salt that has been slowly smoked above an Applewood fire in a centuries old process. 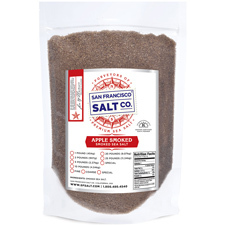 Use our Smoked Applewood Sea Salt whenever you want to add a sweet, smoky flavor to your dishes - without any harshness or bitterness. Our Fine Grain is the preferred choice for sprinkling directly on to food/cooking! 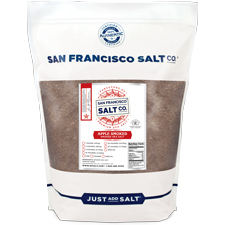 DESCRIPTION - Applewood Smoked Sea Salt is made with pure Pacific Ocean Sea Salt that has been slowly smoked above an authentic Applewood fire. Packaged in our U.S.A., SQF Quality code compliant facility.